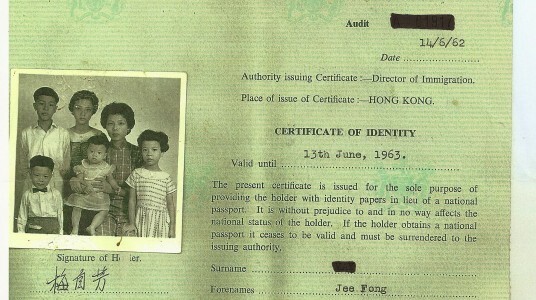 This immigration document issued in Hong Kong contains one of only a few photos taken of Jee Fong and her family before they moved to the United States. My grandmother grasps a mug of strong black tea. She listens closely as my mom explains why I want to videotape our conversation. Itâ€™s my junior year of high school, the day after Thanksgiving, and Iâ€™m sitting in the living room of her home in Atlanta. I watch as her concentrated expression turns to one of understanding. She grins sheepishly at me, speaking in her soft Cantonese. I knew better than that. But I wasnâ€™t aware of just how much I didnâ€™t know. My por por, as I call her, was the person I immediately knew I wanted to feature in my school documentary project about an â€œindividual in history.â€ I knew bits and pieces of her immigration story. She had emigrated from China when Communism threatened her familyâ€™s safety. Some of her relatives who were landowners had been hung, and there was growing pressure to have fewer children, with a continued bias against daughters. The last straw was when her mother-in-law tried to pressure her into putting her first daughter, my aunt, up for adoption. Now, sitting across from her with the cameraâ€™s recording light blinking steadily next to me, I learn that Por Porâ€™s humility belies a truly complex experience. Like many immigrants, Por Por decided to move her family to the United States in hopes of a better life. When the family boarded a plane from Hong Kong to Alaska in June 1962, she left many things behind. She took her memories, though she seldom shared them. 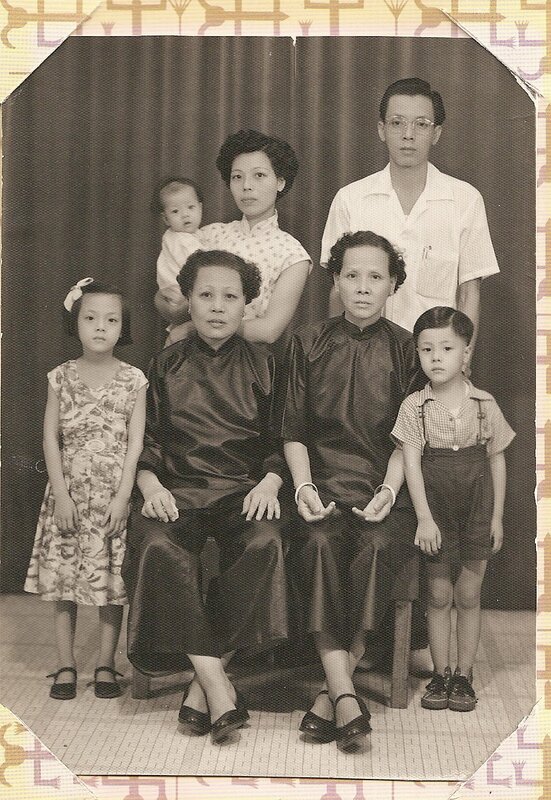 My por por, born Jee Fong Xia on a day lost to long-forgotten records and the added confusion of a lunar calendar, grew up in a mountainous village near Guangzhou, China, the daughter of an herbalist mother and a journalist father. She was in fourth grade when the Second Sino-Japanese War began, and it wasnâ€™t long before bombings forced her to relocate to several different villages. Later, at the height of World War II, her village experienced a serious famine that lasted for nearly a year. It ended only when a nearby bamboo forest blossomed, a process that releases an abundance of edible seeds. Certain bamboo varieties blossom very rarely; the type that populated Por Porâ€™s village, she says, bloom only once every 100 years. As our conversation unfolds, it occurs to me that this is more than just a history project. Por Por is sharing with us memories that she rarely, if ever, mentioned after coming to America. As my mom translates, her frequent expressions of surprise show that even Por Porâ€™s children had never been privy to many details of her life. What we are doing is preserving her memories, and even more amazingly for me, unraveling a story that has never been told before. Toward the end of our conversation, Por Por shows me some documents filled out en route to America. 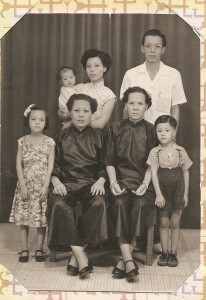 A photo of the family on the day of their departure reveals faces that are a bit tired but overwhelmingly brightâ€”hopeful, she says, for a more peaceful life in the States. I press the standby button on the camera. â€œI donâ€™t know what to say,â€ I tell her. â€œThat was some story, Por Por.â€ She nods simply and sips her now-tepid tea. A few hours pass. I look over at my por por, and match what sheâ€™s told me with the woman of unwaveringly sensible character that I know her to be. They fit, and now two tapes filled with her history ensure that a more complete picture of her is ready to pass to the next generation. Por Por still waves away interest in her life story, still jokes that sheâ€™s just a â€œboring old lady.â€ But I hope that when she reads my carefully written letters in Chinese, when I greet her with the biggest smile at every visit, or when we sit and talk in our halting mixture of only partially comprehended languages, she understands how much respect I have for herâ€”no translation needed.